Swimming is a favorite pastime here in Western Australia, both outdoors at the beaches and rivers and indoors at the pool. It’s great, low-impact exercise too and it’s safe (there are approximately 2 instances of injury for every 1000 swimming sessions). You can hurt yourself swimming though, and most swimming injuries are repetitive trauma injuries with those who swim laps regularly at the greatest risk. However, these types of swimming injuries although quite common are also treatable and even preventable going forward. An injury can either be an acute injury -which is to say a one time injury that occurs suddenly- or it can be a repetitive strain injury which comes on slowly, usually as the result of overusing a muscle, group of muscles, and/or joints etc. Acute injuries in swimming are not common, but they do happen with beginners—for example, poor breathing technique with freestyle and the frog-kick with breast stroke often cause facet joint inflammation. Most swimming injuries are chronic injuries that result from frequent and repeated microinjuries and overuse. Competitive swimmers are especially prone to these injuries as their training regimen is especially strenuous. Recreational swimmers do experience repetitive stress injuries too depending on how often they swim, their physiology/fitness level, and the mechanics of their stroke. Some swimmers are more prone to these sorts of injuries. Physical factors that can contribute to the development of these and other conditions include misaligned joints, muscle imbalance (certain muscles are stronger than others), tight muscles, and unstable ligaments. A poor swimming stroke also puts extra stress on the muscles and the joints and any of the above will often create pain. One of the rotator cuff muscles often implicated in bursitis problems in the shoulder is the increased tone of the supraspinatus muscle pulling the arm high into the shoulder cavity and causing it to aggravate the bursa when the arm is up high. These chronic swimming injuries are musculoskeletal in nature and as such are best handled by a chiropractor. 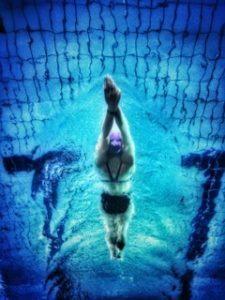 If you live anywhere in South Perth and you’re suffering from swimming related injuries we can help. We are the chiropractor Applecross, Como, Doubleview and Scarborough residents come to when they need help with all of their nervous system and musculoskeletal disorders. In fact, with two locations -one in Scarborough and another in Mount Pleasant- we can serve all of Perth. What Are The Benefits of Long Term Chiropractic Care?